I hope everyone had a great weekend. My wife and I spent Saturday and Sunday watching Syracuse University basketball and the Buffalo Bills both win. We also took the downtown holiday tour where we enjoyed reindeer, ice sculptures, gingerbread houses, and fantastically decorated windows. Very enjoyable for sure! As we enter the last week before break, I wanted to take a few moments to give my thoughts about the holidays. Because I interact with thousands of people each day, I get a birds-eye view of life at its best and worst. The holidays really magnify events, feelings, and emotions, especially for children, and it is really important for all of us to recognize that. It is not rare for children to act differently both at school and at home leading up to the holidays. Some of the reasons can be that routines are about to change, stress about the holidays at home, and student stress about not wanting to be at home for an extended period of time. These are all completely natural occurrences; but should not be overlooked. At the extreme, the holidays can really magnify mental illness, so it is important to recognize that as well. If family members are struggling, try to get them to help. If we see it at school with the students, we will do the same. It is also important to consider perspective. I spent a couple of hours last week at Golisano Children's Hospital visiting three of our sick students. Two are in kindergarten and one is in the high school. As I visited, each were fighting for their lives, let alone wondering what they were going to open on Christmas morning. My tiniest student has been in the same room for a long time, and his "gift" may be to see the outside of those four walls in the next 12 days. Surprisingly, they were all in decent spirits. Something for us to reflect on. I do want to thank our employees and students for their continued generosity. During the school year they collectively buy clothes, provide resources, and visit people who are sick and/or in financial need. Their efforts increase around the holidays. I do not want to miss any effort, so I am not going to list all of the causes that they have been participating in over the past month, but their collective efforts are in the $10,000 range and will help many local families and people. Our famous high school holiday concert takes place this Tuesday at 7:30 p.m. in the high school auditorium. It is fun to watch the students perform while the "snow" falls. The "big guy" also usually makes an appearance. Good stuff! I am not going to post the next two weeks. My family celebrates Christmas, so Merry Christmas to you and your families. Thank you for your continued support, and I will write again in the new year! Well, we finally got a little snow and cold. It was the perfect time to try out my new $26 Costco (Kirkland) waterproof and insulated boots. They passed with flying colors, which I was super happy about. I can now take the money that I would have spent on brand name boots and spend it on Glazed and Confused donuts. Win! New and Different: I did try something new and different this weekend. Being born and raised on the west side, I have really only grocery shopped at the Western Lights and Fairmount Wegmans, Tops, and Price Chopper. My wife and I were on the other side of town, and for the first time in my 46 year history, I stepped foot and shopped at the Dewitt Wegmans. I know, I know, a REALLY big deal. Aside from the burger bar, the aged beef station (I am still on the fence about eating beef that sits out for a month or two, so I passed), and the overall layout; it was a Wegmans. I am sure we made them happy because my son and his friend are coming home for the holidays this week and the bill was about five times what it usually is when my wife and I shop for ourselves! Last week I had an opportunity to tour the brand new Friendly Ford Store in Geneva, New York. Two of my former students (from my teaching years), Jeff McKee and Mike Wilkenson, are the General and Sales Managers (and I am very proud of them), and they gave me a complete tour of the new facility. It was very impressive. One of the bays, the diagnostic bay, featured a new system that can scan a car for any issues when it is hooked up to a computer system. Instead of getting an "OK" as a printout, you get a grade with comments for each major part of the car, and approximately how much time you have until that particular part needs attention. Why do I bring this up? That system for cars reminded my very much of the new standards-based report cards that our elementary students are now receiving. 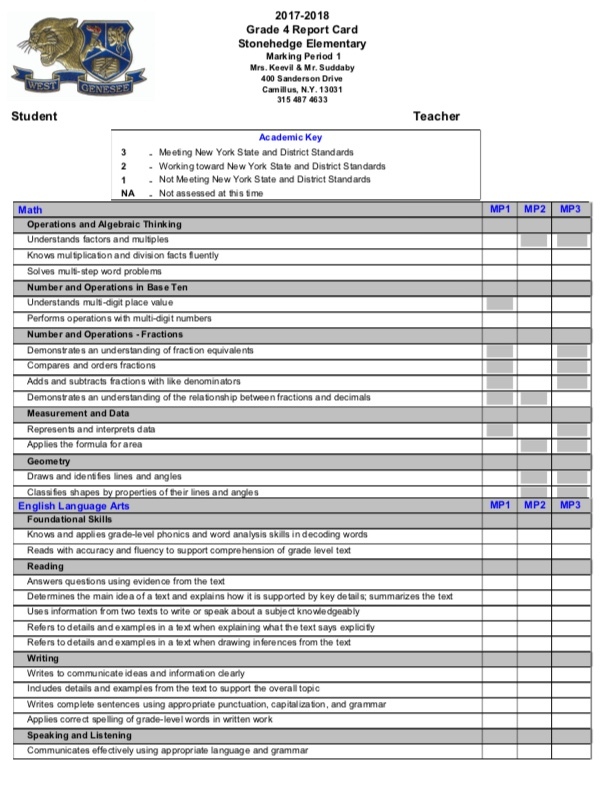 Our teachers and principals designed a report card that gives parents a complete picture, with comments, about every part of a child's learning. It is much easier to see growth areas, and it is much easier to celebrate what is going well. I was excited for parents to receive them for the first time a week or so ago. Change is change, but sometimes it isn't too bad! Update on School Resource Officers: I would like to congratulate our former School Resource Officer, Kelly Grace, on her retirement from the Camillus Police Department. She was our first School Resource Officer and held the job for 16 years before an injury forced her to the sideline about a year ago. She is the definition of class, and she is an outstanding role model for students. She made the position proactive instead of reactive, and she was a large part of the fabric of our District. Congratulations to Kelly and best wishes for a great retirement. Her replacement, Officer Anthony Gucciardi, picked up where she left off a year ago and has spent his time building positive relationships with all of our students. Last week, he surprised some of our elementary students by busting out his piano skills. I thought he was going to play the theme from "Cops" of course, but he had more of a Billy Joel style. The students were impressed! Supporting Charity: Many of you attended the Harvest Dinner that we had at the high school to Support the Senior class and a charity of their choice. They raised $2,000 to donate to the Make-A-Wish Foundation in the name of former longtime teacher, Marsha Schoff, who recently passed away; Outstanding. Featuring a Student: Every now and then I feature a student that you should probably get out to see for free, before you have to pay to see them. Right now that student is sophomore hockey player Dan Colabufo. Our hockey program is stacked with talent, and he really rises to the top as a leader, skater, decision-maker, scorer, and passer. He really does have it all. Robotics Club: I want to end with a feel good story. Our Robotics Club, called the Vex Club, competed against 24 other schools this weekend and did really well. The robots that the students created has to perform several different tasks. They also combined with Liverpool's club to find success. Great teamwork. Dancing or Skating? The high school Semi-Formal Dance, New York City themed, had an indoor ice rink. Who does that? Our students do, that's who. Every year I think the advisers and students have reached the top of the mountain of decorating; and then they outdo themselves. Add incredibly respectful student attendees and a great DJ to the mix and you have a special night. Saturday night was special and over 800 students enjoyed a fantastic evening with their friends. A VERY special thanks to our parent and staff volunteers, administrators, and the Camillus Police Department (who all dressed in their semi-formal attire as well) for a terrific evening. A Partnership for Good Health: We have been working on a large partnership with the American Heart Association to bring a large-scale wellness effort to the District for our employees. We are completing our walk around the world challenge and this new partnership with the American Heart Association will allow us to expand our wellness efforts (to those who want to work on being healthy) into the areas of blood pressure, heart rate, cholesterol, and body mass index. The cool thing is that when we launch this initiative after the holidays, we will be able to expand it to include students and/or whole families who want to participate. The benefit of partnering with a large organization for this effort is that we can use their resources, rewards, and tools at no cost. Stay tuned after the holidays for this exciting opportunity. Trying Something New: This blog gets read by over 5,000 people each time it is posted (some posts get close to ten thousand), but I think we can do even better. While I was watching 60 Minutes a few weeks ago, I noticed that after their main stories, they had Internet links you could visit to get more about the story. With that in mind, I am going to experiment with a podcast that will help to introduce you to the Wildcat family, and also expand on topics of interest. I am working with Rob Leo, Coordinator of Instructional Technology, to find the right tool to use so that it is familiar to you and easy to use if you are new to podcasts. I always treat the use of new communication technology as an experiment (As examples, Twitter was my first experiment, and it worked out; Instagram was another experiment that did not work out) so be on the lookout for that after the holidays as well. Technology Article: Speaking of Rob Leo, he is responsible for the professional development for the technology we make available to students and staff. If you are a school leader or educator reading this, check out the article that he recently had published about the professional development model behind all of the Chromebooks that schools are receiving through the federal Smart Schools Bond Act. It is fantastic and a model to be emulated for sure. Clearing My Head: Every Saturday or Sunday morning, I go on a "long" run, of somewhere between six and ten miles. When I started running, I could barely breathe, let alone talk. As I have gotten into better shape, those runs have become great conversation time with my running partners, Jim and Mike (pictured). I always chuckle when people see us talking while we run, wondering what they think we are actually talking about. The past couple of weeks have been about whether the impact of Brexit has been worse for Ireland or London (we think Ireland), and the potential impact of the upcoming tax law changes by income bracket for individuals and businesses (not sure enough to officially comment). Riveting stuff. At any rate, it is a good time for me to clear my head, NOT talk shop, and get some miles in with great people! Busy week ahead. I am sure I will see you at something. Enjoy the week!